MAY 24, 2016: Today, the MA State Senate unanimously passed an amendment to the FY17 budget that extends the municipal retiree insurance premium moratorium for two years - until July 1, 2018. Amendment 91, which received widespread bipartisan support, was passed on a voice vote during the first day of the Senate budget debate. MAY 23, 2016: Members are asked for your help in protecting municipal retirees and retired teachers. Health insurance benefits for both groups are largely under the control of local governments, some of which are now threatening to increase insurance premium contribution percentages. November 2015 Voice: With municipal health insurance reform in 2011, there was a spike in the number of Public Employee Committees (PECs) across the Commonwealth. Currently, some 185 Association members are serving as retiree designees on PECs that negotiate with local officials over health insurance plans. MARCH 5, 2015: Monthly insurance premiums for the 425,000 enrollees of the state’s Group Insurance Commission (GIC) will increase starting in June. The increase in monthly premiums is the result of higher medical inflation across nearly all GIC plans. Essentially, the price of medical care and prescription drugs is once again on the rise. 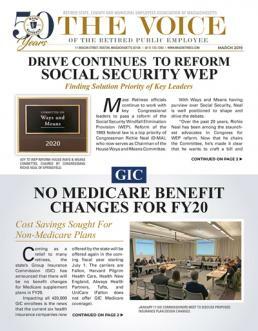 FEBRUARY 18, 2015: Following an extensive search process, the state’s Group Insurance Commission (GIC) voted to retain CVS CareMark for at least another three-years beginning July 1, 2015. The Rhode Island-based firm has been the pharmacy benefits manager (PBM) for the GIC’s UniCare plans since 2010. February 4, 2015: Association officials were present and offered testimony at the state Group Insurance Commission’s (GIC) annual public hearing held today at the State House. OCTOBER 1, 2014: Last week, the Mass. Taxpayers Foundation (MTF) released its latest report on municipal retiree health insurance. As expected the report finds that the cost of municipal health insurance plans is unsustainable, and as such, benefit reductions are called for. Click here to view the report. July 2014 Voice: Retired teachers and municipal employees will receive a two-year reprieve from increased health insurance contribution percentage rates due to a provision contained within the FY15 state budget. The law extends the same protection to municipal retirees that has been long afforded to state retirees.